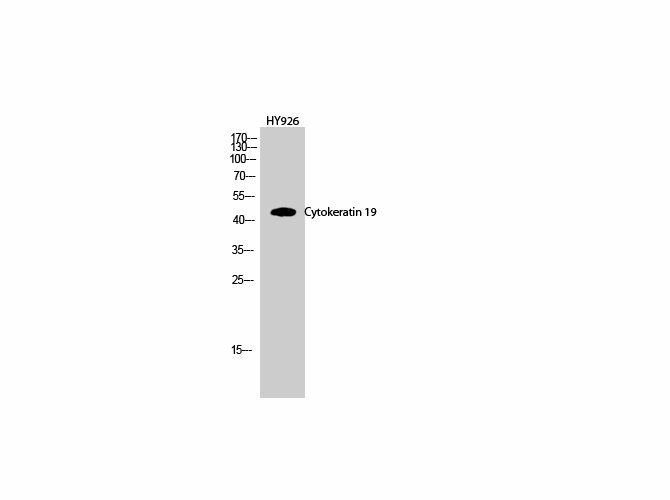 Synthesized peptide derived from the Internal region of human Cytokeratin 19. Small volumes of anti-KRT19 antibody vial(s) may occasionally become entrapped in the seal of the product vial during shipment and storage. If necessary, briefly centrifuge the vial on a tabletop centrifuge to dislodge any liquid in the container`s cap. Certain products may require to ship with dry ice and additional dry ice fee may apply. Western Blot analysis of HY926 cells using Cytokeratin 19 Polyclonal Antibody at dilution of 1:1000. 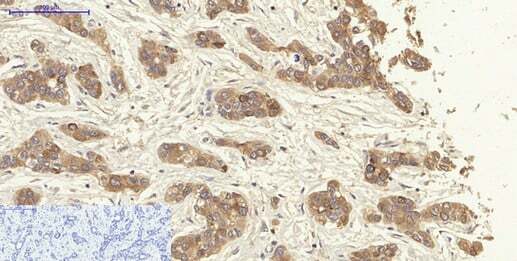 Immunohistochemistry of paraffin-embedded Human liver cancer tissue using Cytokeratin 19 Polyclonal Antibody at dilution of 1:200. Immunofluorescence analysis of Human liver tissue using Cytokeratin 19 Polyclonal Antibody at dilution of 1:200. NCBI/Uniprot data below describe general gene information for KRT19. It may not necessarily be applicable to this product. K19: a type I cytoskeletal keratin. The keratins are intermediate filament proteins responsible for the structural integrity of epithelial cells and are subdivided into cytokeratins and hair keratins. Keratin 19 differs from all other IF proteins in lacking the C-terminal tail domain. Unlike its related family members, this smallest known acidic cytokeratin is not paired with a basic cytokeratin in epithelial cells. It is specifically expressed in the periderm, the transiently superficial layer that envelopes the developing epidermis.